Buzzwords overflow in the tech world. Often coined by vendors for promoting new concepts and ‘solutions’, buzzwords can confuse users and become meaningless over time. Tech professionals have different opinions towards recent buzzwords including: cloud, big data, the Internet of Things, SDN (software-defined networking), enterprise social networks, and augmented reality. When do buzzwords move beyond the hype stage and bring real value? CWHK talked to tech veterans and analysts who share their insights on current buzzwords and whether they will be here to stay. Big data is the most over-hyped buzzword today, said Ian Bertram, managing VP at Gartner. “Big data will see the trough of disillusionment in the next 12-18 months,” he noted. According to the research firm, when a technology is in the trough of disillusionment (a stage in Gartner’s hype cycle), interest in it wanes as experiments and deployments fail to deliver. Providers of the technology then fail, while investment continues only if the surviving providers improve their products to the satisfaction of early adopters. By Gartner’s definition, big data is high-volume, high-velocity and high-variety information assets that demand cost-effective, innovative forms of information processing for enhanced insight and decision making. But organizations focus too much on what big data IS, while missing the impact brought by the technology, said Bertrand. “Organizations forget that big data also brings about changes in processes and decision-making, while lacking the skills they need to make good use of related technologies,” he noted. Bertram also sees a future for big data. “While some big data technologies are mature today, people will eventually realize that big data is a diverse form of data—just like e-business is one type of business,” he said. According to Midland’s Fung, cloud is not new, but similar to ASP (application service provider)—a buzzword coined more than 10 years ago. “Now vendors call a whole bunch of technologies ‘cloud’—these include virtualization, SaaS, IaaS, private cloud, and public cloud. Users must know which technologies they need and not be confused by these buzzwords,” he said. Gartner echoes Fung’s advice, arguing that there’s still a lot of ‘cloud-washing’: market confusion on exactly what the technology is. For instance, just throwing a hypervisor on a server is not private cloud computing, said Gartner analyst Tom Bittman. While virtualization is a key component to cloud computing, it isn’t a cloud by itself, he said. Virtualization technology allows organizations to pool and allocate resources, which are part of the definition by the US-based National Institute for Standards in Technology, he added. “But other qualities around self-service and the ability to scale those resources is needed for it to technically be considered a cloud environment,” he pointed out. He said that Midland Realty makes use of cloud technologies. “We put leaflets on the cloud and have built a Dropbox-like app for our staff to use—they can also print documents from anywhere,” said Fung. There aren’t many successful implementations of enterprise social networks in Hong Kong because businesses worry about issues including those related to privacy, security, and compliance, said Lee. Midland Realty is one a local firm considering the creation of an enterprise social network. While this allows Midland Realty to collect data for analyzing how customers and employees view us, Fung said issues—such as how you curate content and moderate discussions—worry the company. “We must first come up with related policies to deal with these issues,” he said. But there aren’t many successful cases worldwide either, according to Gartner. The advisory firm said that while many large companies worldwide are embracing internal social networks, they’re not getting much value from them. By 2016, some 50% of enterprises will have internal Facebook-like social networks, and 30% of these will be considered to be as crucial as email and telephones, the analyst firm says in a report on the subject released earlier this year. Through 2015, 80% of social business efforts won’t achieve their intended benefits due to inadequate leadership and an over-emphasis on technology, according to the report. That’s because social software doesn’t work like an ERP application, which uses a “push” mentality, where workers are trained on an app and then expected to use it, Gartner said. A series of conditions must be present for social software to be successful, including a meaningful and specific purpose, a critical mass of colleagues actively using it, and integration with other applications workers are using, the firm said. While most companies’ social software projects lack maturity, lessons are already being learned and better practices are emerging, Gartner said. Still, customers just starting out with social software should be careful when they choose their first pilot, since it will set the tone for subsequent initiatives, the research firm added. The IoT carries a number of definitions. But in general, the IoT refers to uniquely identifiable objects, such as corporate assets or consumer goods, and their virtual representations in an Internet-like structure. The idea of the IoT first became popular through the Auto-ID Center, a non-profit collaboration of private companies and academic institutions that pioneered the development of a Web-like infrastructure for tracking goods around the world through the use of RFID tags. The center closed operations in 2003 and EPCGlobal was created to continue the effort to commercialize EPC (Electronic Product Code) technology, and the center’s research is carried on today by Auto-ID Labs at various universities worldwide. While RFID is often seen as a prerequisite for the IoT, the concept includes Web-enabling virtually any type of product or machinery so that data about the object can be captured and communicated. In effect, these networked things become “smart objects” that can become part of the Internet and act as active participants in business processes. Current or potential examples of the IoT include a vast array of objects: fleets of trucks, medical equipment, vending machines, construction equipment, gas and electric meters, thermostats, household appliances, advertising display signs, and many others. SDN is conceptually appealing for telcos, but vendors pushing SDN tend to subscribe to their own hype, observed Clement Teo, senior analyst at Forrester Research. “At the recent Mobile World Congress 2013, Forrester spoke to several network vendors and none of them had a clear vision of how SDN might affect end-user business processes,” said Teo. For enterprises, SDN can help CIOs deal with the challenges and opportunities for line-of-business managers that consumerization brings, according to Teo. Business line managers increasingly demand that CIOs provide tools to deal with, for instance, faster go-to-market, real-time, and context-based marketing, he added. “While SDN constitutes a support tool for emerging data analytics, this has yet to translate into a strategic alignment between line-of-businesses and the CIO’s office,” he said. 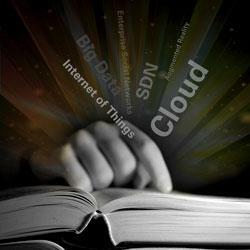 Lee believes that SDN will gather more steam when the industry comes up with standards. “Standards are needed because SDN is supposed to work across different platforms while adopting organizations must integrate with existing networks,” he said. Analyst firm Semico predicts that the augmented reality market will be worth US $600 billion by 2016. But will organizations put it on the back burner because of high deployment costs? While Midland Realty is exploring AR for the provision of comprehensive information of properties, the firm finds it a time-consuming and costly project at this stage. “We’d like to allow people to have information and photos of properties instantaneously when they point their phone camera to actual properties on streets,” Fung said. To make this happen, Midland Realty must take pictures of a huge number of buildings throughout Hong Kong. “If we go about it, we’d do this photo project in different phases because there are so many buildings in Hong Kong,” he said, estimating that photo taking alone will cost more than HK$100,000 and the entire project less than HK$1 million. There are certainly more buzzwords than those mentioned here. NFC, HTML 5, 3D printing, mobility, IT consumerization, and Google Glass are buzzwords that various tech pros we talked to see as hype today. While we aren’t sure which ones will stay and benefit their users, do expect history to repeat itself: change of buzzword definitions and more confusion before some successful cases.